Since 1998 the band has been on the road with another singer. In 2001, leadsinger David decided to leave the band and Chuong (the Asian-flavoured guy) managed to convince the others of his amazing singing technique. Immediately a lot of songs had been written and in march 2002 their first album "Seeing clearly for one moment" was recorded, which reflected the high potential the band gained through the time. 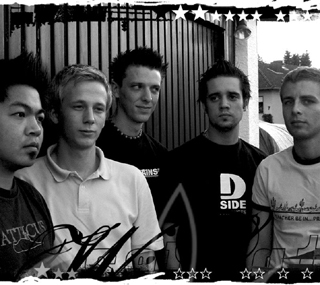 The band signed to the young and growing german punkrock label RP-Punkrock (www.rp-punkrock.com). With their help and the help of their booking agency (www.totalhorrorbooking.com) A COMMON GROUND was often booked as a support act for famous bands. They played several shows with Donots, Diesel Boy, Voodoo Glow Skulls, Undeclinable, Venerea, ... and had been represented on a few compilations. They even obtained a hearing in Switzerland, France, Belgium and Luxembourg. In 2003 they recorded their second album "Waiting for a change to come" and did a European Tour through the Netherlands, Belgium, Germany, Austria, Italy, France, Spain and Portugal.